Five years after Atlantis completed the space shuttle program's final voyage, NASA is still at least a year away from launching its astronauts from U.S. soil. 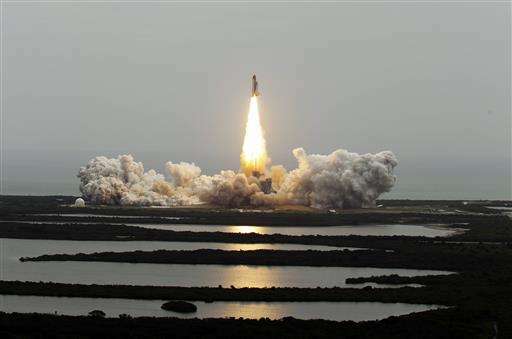 When Atlantis returned to Earth on July 21, 2011, everyone knew there would be a lengthy gap. But the pilots who guided Atlantis to one last "wheels stop" are doing all they can to hurry up the future, albeit from different teams. One works for Boeing on the company's Starliner crew capsule under development. The other is one of four NASA astronauts training for the initial test flights. This unprecedented switch from government to commercial rocketships promises to usher in a whole new era, according to Atlantis' commander Christopher Ferguson. Think space tourists, orbiting factories, lunar camps, private Mars labs and more. "We're on the verge of commercially taking people back and forth to low-Earth orbit. This is practically unheard of," Ferguson said earlier this month. He now works for Boeing, one of two private companies coming up with new capsules to carry astronauts. Boeing's Starliner is set to sail to the International Space Station in early 2018. SpaceX's souped-up Dragon capsule is scheduled to launch by the end of next year. 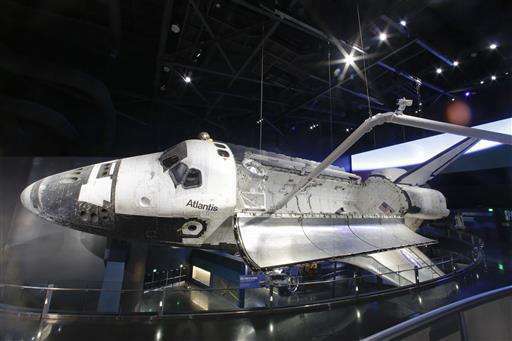 Ever since shuttles Atlantis, Discovery and Endeavour retired to museums, Americans have been stuck riding Russian rockets to the space station. NASA has been relying on SpaceX and Orbital ATK to keep the station supplied. The latest cargo Dragon arrived Wednesday. Its primary payload: a docking port needed for the crew-worthy Dragon and Starliner. Commercial space stations likely will replace the multination space station, Ferguson noted. "So we're sort of setting the stage for commercial habitation of low-Earth orbit—all with the intent of going beyond," he said. NASA is looking to send astronauts to Mars in the 2030s. It is developing the Orion spacecraft to do just that, along with a mega-rocket set to debut in 2018. On this fifth anniversary of the last shuttle flight, space station commander Jeffrey Williams prefers to focus on the future, rather than the past. "It was tough for everybody to retire the shuttle," Williams said from orbit last week. "It was a great vehicle and did its job. But that's the point—it did its primary job. It fulfilled its primary purpose" of building the station. 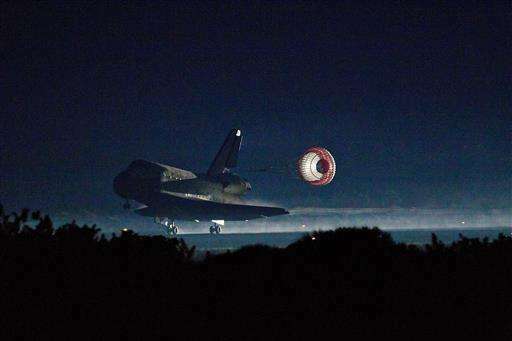 During a July 8 commemoration of the shuttle's last liftoff, Ferguson and his co-pilot Douglas Hurley recalled how they had to practically be dragged from the cockpit following touchdown. Hurley is now training for test flights of the new capsules. "I didn't want to leave," Ferguson said. "I just thought, 'We're not done yet.' And it's true. We're not done yet." Hurley noted how he, Ferguson and the two other Atlantis astronauts—Sandra Magnus and Rex Walheim—turned out the cabin lights the night before landing and took in the views of Earth. Their space station visit had gone incredibly well, and the goodbyes with many of their flight controllers had been said. "I just remember just sitting there going, 'This is unbelievable, I can't believe I'm doing this.' ... The whole mission kind of came crashing in." Kennedy Space Center's director, former astronaut Robert Cabana, said it was bittersweet hearing Atlantis' twin sonic booms on return one last time. After 135 shuttle flights spanning 30 years, "it was sad, but there was a great joy about it, too." A postscript: Thanks to SpaceX, the sonic booms are back. For only the second time, the leftover first-stage booster of a SpaceX Falcon rocket landed back at Cape Canaveral following Monday's launch, its return heralded by sonic booms. Like the first time in December, the booster touched down vertically just a few miles from where it took off on the space station delivery mission. No longer accustomed to these booms, some area residents called 911 to report a middle-of-the-night explosion. Pathetic. Begging the corrupt Russians for trips into space. Thanks Obama. 1.5 Billion a year to launch the Shuttles. Besides, what is the harm with Russian crafts, ISS is half Russian? Also, when the decision of ISS was made, part of it was to stop Russian from becoming *more* corrupt, by making the technology stay in Russia instead of selling out ballistic missile knowledge to banana republics. The current Russia is rather more despotic than merely corrupt. Since the 1960's people have been blowing their horns about private enterprise advancing spaceflight. So far, it's been a big flop. Nothing impressively new has come from private enterprise in space. In many ways they've only repeated what was gone in the 1950/1960's with government projects and funding. All I hear are grand promises from the privatization advocates.